All Astronomy 153 and 154 students are required to complete one evening of Rooftop Telescope Labs (T-Labs), which count for 20% of the lab grade. T-Labs will begin the week of January 14, 2019. Signups for T-Labs are will be online soon. See the Telescope Labs section for more details. Make sure to sign up early and often! 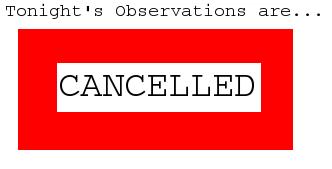 Knoxville weather forces rooftop astronomy cancellations approximately 50% of the time! Signing up early and many times over the semester is the key to completing T-Labs! The last week to complete T-Labs is the week of April 1, 2019. Please complete your T-Labs as soon as possible. See the class links on the left for the complete lab schedule. See the exercises link on the left for the lab exercises.